Watermelon becomes grainy and dry when it ripens past the optimal point at which it should be eaten. An ideal watermelon is moist and juicy. Its flesh is bright, rather than dull and mushy. 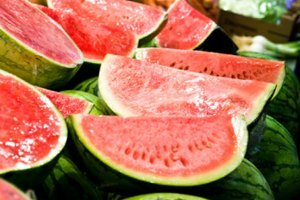 Buy fresh watermelons, store them in cool temperatures, and eat them soon after purchase in order to ensure that you never eat a grainy watermelon again. Watermelon gardeners rely on several signs to tell them when a watermelon is ripe and ready to harvest. The light green tendrils on the watermelon's stem turn brown when ripe. The watermelon skin turns a dull color, and becomes resistant to penetration by the thumbnail. Finally, the bottom of the watermelon, where it lies on the ground, turns a yellowish color. Watermelon ripening can be hastened by picking the fruit and putting it inside a paper bag, but a watermelon subjected to this treatment can quickly turn from ripe to grainy. When selecting a watermelon to eat, test it by slapping it. A ripe watermelon will emit a hollow thump. Buy watermelons that are symmetrical, with rinds that are firm and unblemished. 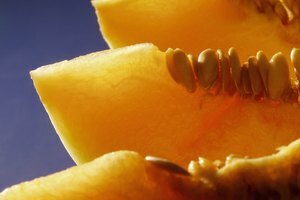 If one side of the melon is flat and yellowish-brown, that indicates that the watermelon has been sitting on the ground a long time and is ready to eat. 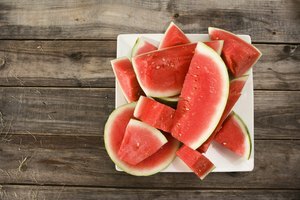 If you are buying cut slices of watermelon, look for a bright color and moist texture to the fruit, so that you don't end up with grainy watermelon. Watermelon season in the United States extends from the middle of June through the end of August. This is the ideal time to pick up a fresh, local watermelon from the grocery store. Watermelon can be stored at room temperature for up to 2 weeks. Wash it with soap and water before cutting it. Once you have cut it, refrigerate any leftover pieces in plastic bags or containers, or they will become grainy from exposure to air. If you find your watermelon to be a bit grainy, try combining it with other ingredients in a recipe rather than eating it on its own. 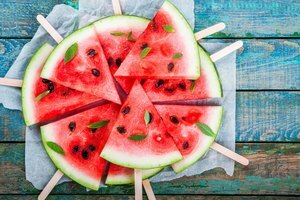 The Washington Post has a recipe for watermelon pizza, which includes a mix of Brie and Parmigiano-Reggiano cheeses. The watermelon, along with basil leaves, is added near the end of the cooking process. Watermelon can also find its way into a salad, with arugula, onion and crunchy walnuts to balance the watermelon's softness.